Tourism Report: Kuakata is a town known for its panoramic sea beach. It is located in south-eastern Bangladesh, and is the number two tourist destination in the country. Kuakata beach is a sandy expanse 18 kilometres (11 mile) long and 3 kilometres (1.9 mi) wide. From the beach one can have an unobstructed view of both sunrise and sunset over the Bay of Bengal. The name Kuakata originated from the word ‘Kua’-the Bengali word for “Well” which was dug on the sea shore by the early Rakhine settlers in quest of collecting drinking water, who landed on Kuakata coast in the eighteenth century after being expelled from Arakan (Myanmar) by the Mughals. Afterwards, it has become a tradition of digging Well in the neighbourhoods of Rakhaine tribes for water. Kuakata is located in Kalapara Upazila, Patuakhali District. It is about 320 kilometres (200 mi) south of Dhaka, the capital, and about 70 kilometres (43 mi) from the district headquarters. According to the 2011 Bangladesh census, Kuakata had 2,065 households and a population of 9,077. Kuakata is the place of pilgrimage for both Hindu and Buddhist communities. Innumerable devotees arrive here at the festival of ‘Rush Purnima’ and ‘Maghi Purnima’. On these two occasions the pilgrims take holy bath at the bay and participate in the traditional fairs. One may also visit the 100 years old Buddhist Temple where the statue of Goutama Buddha and two wells of 200 years old are located. Kuakata offers a full view of the sunrise and sunset from the same white sandy beach in the water of the Bay of Bengal. Locally known as Shagor Kannya (Daughter of ocean), the long strip of dark, marbled sand stretches for about 18 kilometres (11 mi). The long and wide beach at Kuakata has a typical natural setting. 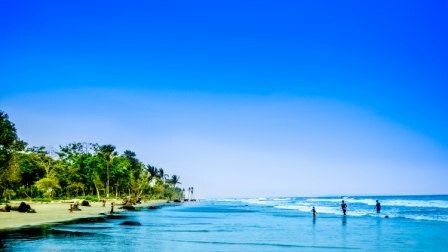 This sandy beach has gentle slopes into the Bay of Bengal. Kuakata is also a sanctuary for migratory winter birds.